An underperforming component (a diode) used in some EDC-D10A remote magnetometers causes "type 2" OATs to erroneously report higher OAT than is actually being experienced by the probe. This problem does not affect all EDC-D10A units; but of those it does, the issue exists in two different forms depending on manufacture date. One form is more pronounced than the other. In both cases, OAT will be reported higher than actual at lower temperatures. Because temperature is erroneously reported higher than it should be, the one possible safety concern that could arise from an incorrect OAT reading is eliminated. If you are relying on your EFIS's OAT-based density altitude calculation, it will be computed as a higher altitude than correct when the OAT is reporting a high temperature. If you are further using that density altitude calculations to compute runway requirements, you will end up with a longer computed runway requirement. Though of course not optimal, this will not compromise safety by allowing you to think you can take off from a shorter runway than you really can. This problem IS NOT FOUND in older EDC-D10 remote magnetometers (note the missing trailing "A") which are hooked up to the original EFIS-D10. This problem IS NOT FOUND in EDC-D10A remote magnetometers with a serial number higher than 7779. This corresponds to units shipped on or after 10/15/2007. It is not believed that this problem exists on any EDC-D10A units with a serial number lower than approximately 3300, or units that were shipped from Dynon Avionics before February 2005. A positive way of identifying whether your unit has this problem is described below. Though your EDC-D10A may have the bad component, this problem WILL NOT AFFECT you if you do not have a "type 2" OAT hooked up to your EDC-D10A. This OAT is sold under part number 100433-001. It is identifiable by a small piece of black heat shrink tubing around the wires near the sensor end of the probe. Below -10 degrees Fahrenheit, the OAT displayed will be higher than the actual OAT. Below 40 degrees Fahrenheit, the OAT displayed will be higher than the actual OAT. Note that in both of the above cases, the displayed temperature WILL continue to decrease, albeit incorrectly, as the actual OAT decreases. If your EDC-D10A is in either of the above ranges, but has a "D3" marking (either labeled or handwritten), your EDC-D10A has already been fixed and needs no further work. In addition to verifying via comparison with the serial number ranges above, you may open your EDC-D10A to authoritatively check whether or not your magnetometer is among those affected. This action will not void your warranty. You may also choose to send your unit in based solely on the serial number checks described above. The EDC-D10A can be opened by removing the four brass screws on the sides of the shell. The cover of the EDC-D10A with the serial number can then be removed by lifting it straight up. Once open, look for the small black component in the picture below. 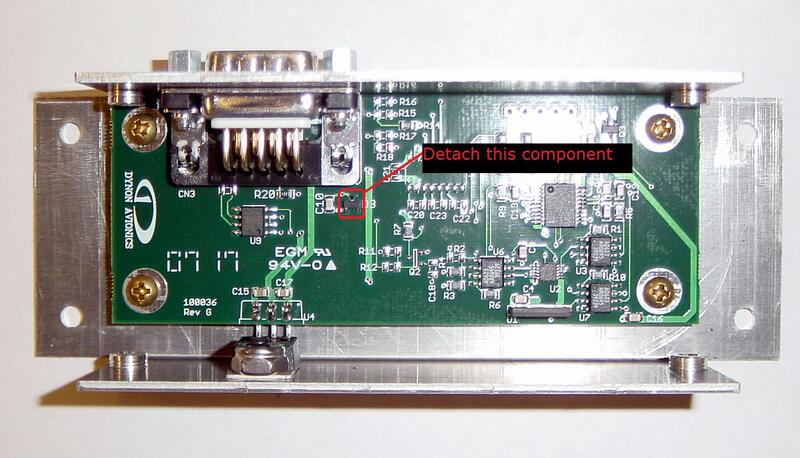 If that component is there, it needs to be removed, either by you or by Dynon Avionics. If the space is blank, your EDC-D10A does not suffer from this problem. Also note that your circuit board color may vary. The presence of this component is the sole definitive indicator of whether or not your unit is affected. If you own an EMS product or a FlightDEK-D180, you can move your 3 wire type 2 OAT from your EDC, to a spare EMS GP input as described in the installation manual. Alternately, you can fix your EDC-D10A, either yourself or by sending it to Dynon Avionics as described below. If your EDC-D10A is affected as above, you have two options. Clearly label the package you send with the words "EDC RECALL"
Enclose a letter with your return shipping address. Dynon Avionics will cover the cost of shipping your EDC-D10A back to you. You may elect to try to fix this issue yourself, per the instructions below. This action will not void your warranty, and it is exactly the same fix as we perform here if you elect to send it in. If you inadvertently damage your EDC-D10A while trying to fix it, you may send it in per the above instructions and Dynon Avionics will still fix it under warranty. 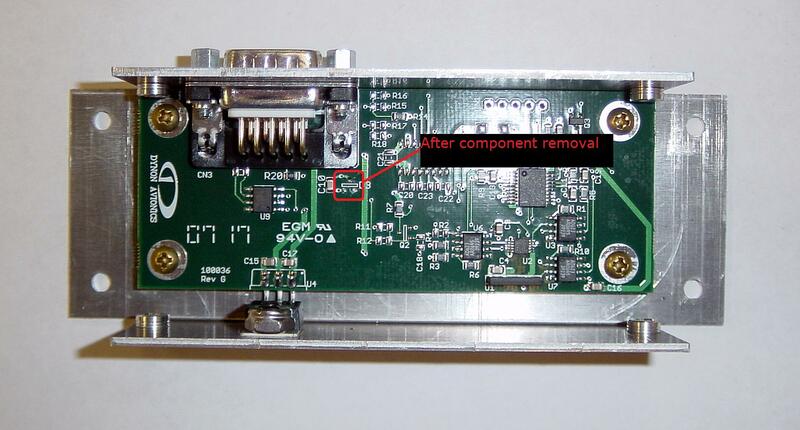 The component highlighted in the picture below is the one to be removed. Fortunately, it is not needed for correct operation of the EDC-D10A or OAT. Before beginning work on your EDC-D10A, make sure you take the appropriate steps to eliminate damage from ESD (electrostatic discharge). The easiest way to do this is to make sure you have continuous contact with the EDC-D10A's chassis. Additionally, make sure you touch the chassis before anything on the circuit board. For more detail about taking precautions against ESD, see this article. The easiest way to remove the component is to use a pair of precision wire cutters or dikes to cut it out. Desoldering the component is acceptable as well, but is harder to do on such a small scale. Instead of trying to clip the leads directly, we have found it easier to start by cutting right down the middle of the black center portion of the diode itself. After it has shattered, use the cutters to clean up the area so that there are no remnant of the component remaining. In particular, there should be no remaining protrusions or leads that should be able to touch each other. The area should be essentially bare when you are finished. Clear out any remaining debris and ensure that all remnants are outside of the enclosure. After you've removed the component and have the EDC-D10A put back together, please clearly mark the EDC-D10A with the label "D3". This will let any future owner of your EDC-D10A know that it has been fixed.